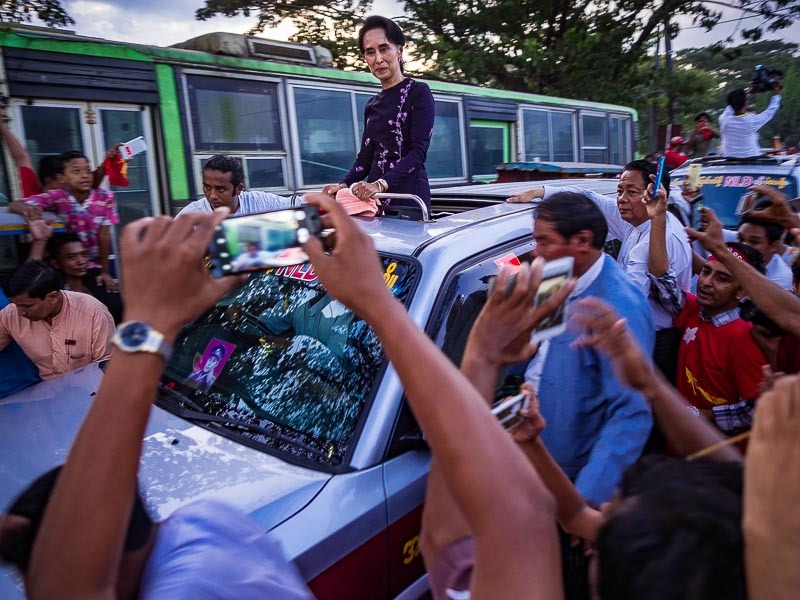 Burmese democracy icon Aung San Suu Kyi arrives at the final rally of her 2015 election campaign. 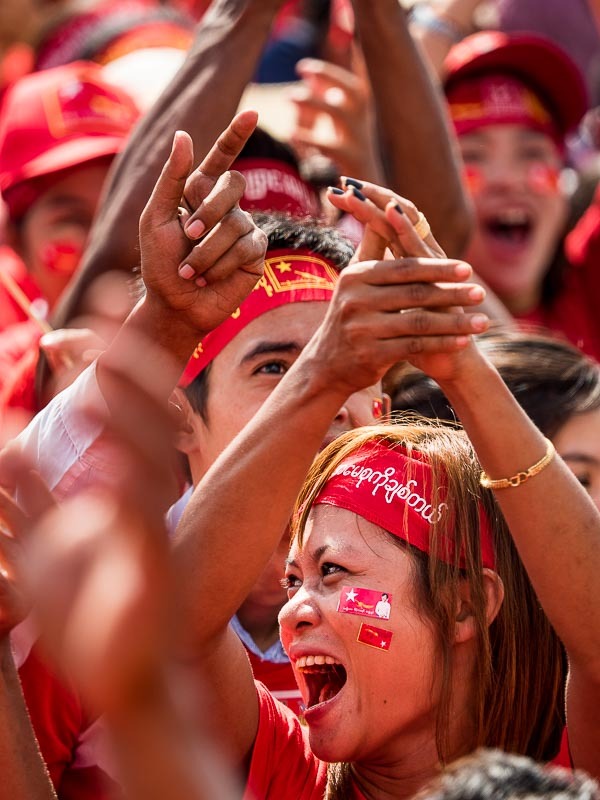 Myanmar is holding historic elections Sunday, Nov. 8. The hybrid military/civilian government (25% of the parliament is reserved for military officers) is facing a plethora of parties in the coming elections. 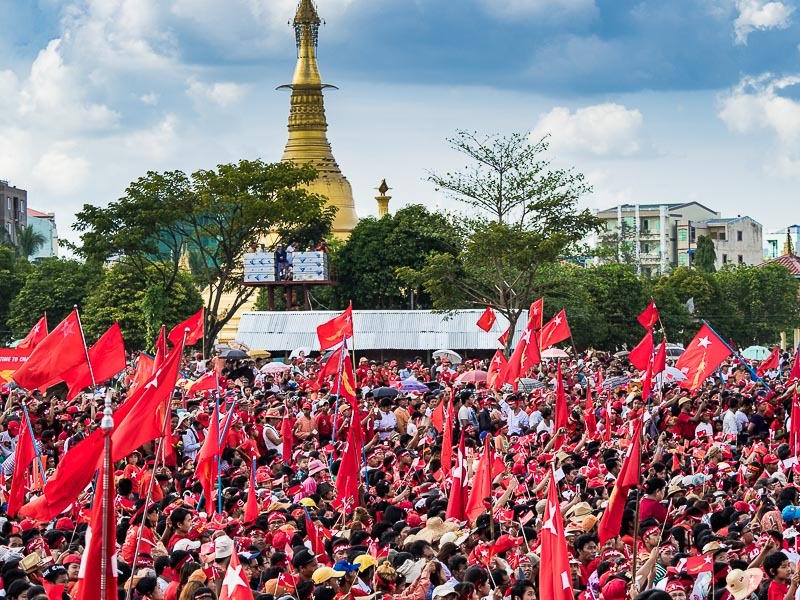 The big one, of course, is the National League for Democracy, the NLD, the party of Aung San Suu Kyi and the party widely credited with a landslide victory in Burma's 1990 election and an outgrowth of the 88 protests against the government. The military nullified the 1990 election after their shellacking. A NLD supporter carries the NLD flag to the rally with Suu Kyi. 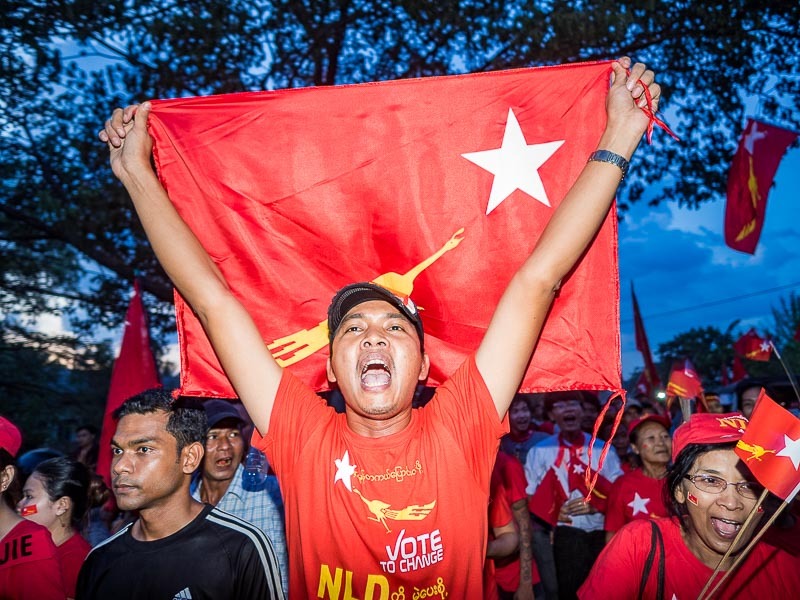 Complicating the NLD's hopes for victory are the new parties that formed after the election was announced. Most of them are not national parties in the sense that the NLD and USDP (Myanmar's ruling party) are. Rather they're ethnic parties that represent people in Myanmar's ethnic minority communities. There are parties in Shan State that represent Shan interests, parties that represent Rakhine interests, parties that represent Wa interests and so on. Myanmar is a checkerboard of ethnic groups. NLD supporters laugh at entertainers who warmed up the crowd before Aung San Suu Kyi arrived. 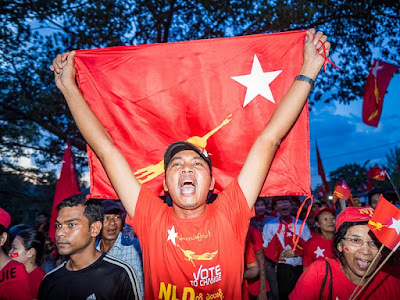 Also complicating the NLD's future is the make up of the Myanmar parliament. Under the current constitution, 25% of the parliament is reserved for military officers. That means the incumbent USDP (supported by the military) only needs to win 26% of the vote to control parliament (25 + 26 = 51), while the NLD needs to win nearly 75% of the vote to get an outright majority in parliament. Winning a simple majority of the vote would mean a coalition government with the ethnic and other lesser parties. And while Suu Kyi is the most popular political personality in Myanmar, she's constitutionally prohibited from holding the office of President. She was educated outside of Burma, married an English man and has two sons who hold UK passports. The Myanmar constitution says that only a Burmese person married to a Burmese person with Burmese children (if they have children) can be President. Her marriage disqualifies her from the Presidency. 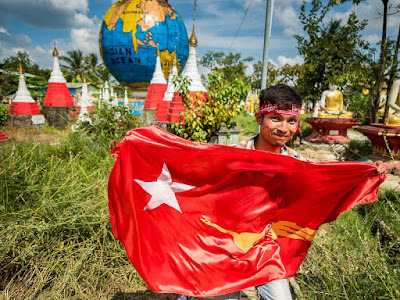 A man in traditional ethnic dress waves the NLD flag during the rally. 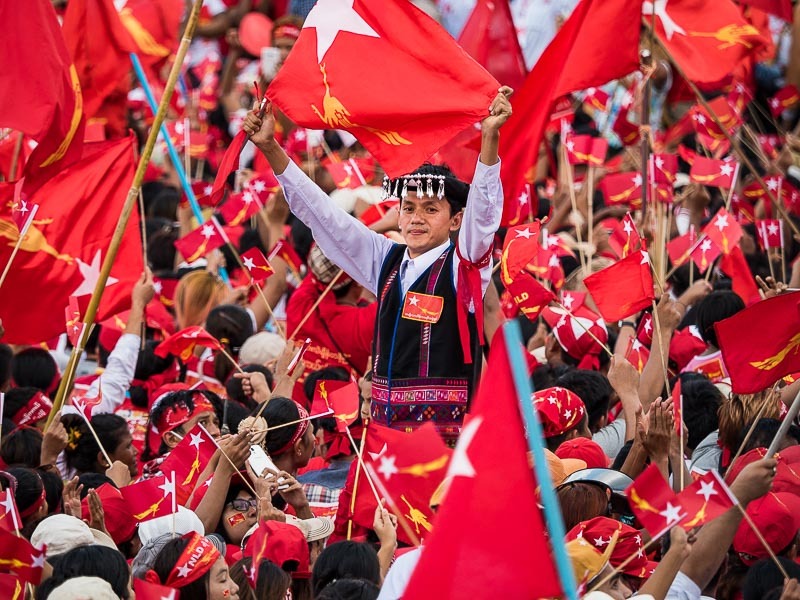 So even though everyone is looking forward to the election to see how just how far Myanmar has come in its transition to democracy, in many ways the outcome will present a whole host of new challenges. Sunday's rally was interesting. The NLD wanted to hold the rally in a large park in central Yangon, but authorities wouldn't give them permits for that, saying they would congest traffic. Instead they were consigned to what was euphemistically called a sports complex and I would call a pasture. There were no grandstands, locker rooms, lights, parking lots or even goal posts that mark a usual sports complex. It was a flat, open dusty field, about the size of a soccer pitch. It was a really small space. With zero shade or amenities. Men climb a tree to get a glimpse of Suu Kyi. 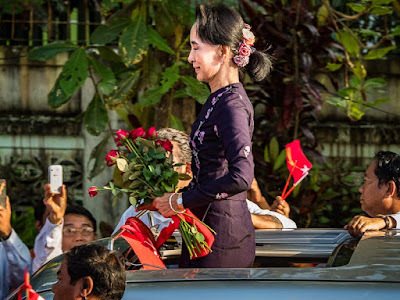 While Suu Kyi, "the Lady," drives by. People showed up four hours early to see their hero. Despite the heat and gruelling sun, they sang and danced with the musicians and laughed at the comedians. When the Lady's motorcade (she's called the "Lady" because under Burma's dictatorship of the 1990s, when she was under house arrest, it was illegal to say her name), the crowd went silent, and as the motorcade came into view people erupted in cheers, chanting "NLD" and "Aung San Suu Kyi." A part of the crowd at the rally. The zedi (chedi) of nearby pagoda towers over the crowd. The rally was supposed to start at 3 and The Lady was supposed to arrive at 4. I got there about 12.30 and entertainers were already performing and there was a good sized crowd in front of the stage. By 3, the field (sports complex?) was packed. Suu Kyi was a little late, she arrived 4.15-4.30. I was on a camera riser and made some photos of her arriving and speaking and then jumped down to work the crowd. Burmese media estimated the crowd at about 40,000 people. I have no idea how accurate that is. It's reported to be the largest crowd at an election event during the current campaign. But I do know the crowd was so dense I couldn't move through it. The field was absolutely jammed with people. The crowd overflowed into surrounding streets, temples and homes. I am not going to say it was the largest crowd I've ever seen. Certainly some of the Red Shirts crowds I photographed in Thailand were bigger. But it was the most densely packed crowd I've ever worked in. It simply was not possible to move through the crowd. Even in the largest Red Shirt crowds I could always get around. Aung San Suu Kyi leaves the rally. This is an amazing time to be here. 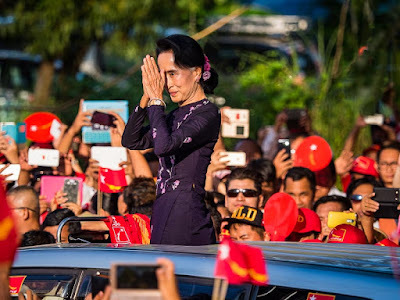 I never dreamed during my first trip to Myanmar in 2009, when I was followed by state security agents, that I would be back here when Aung San Suu Kyi would be allowed to campaign openly for office and Myanmar would be more democratic than some of its Southeast Asian neighbors. 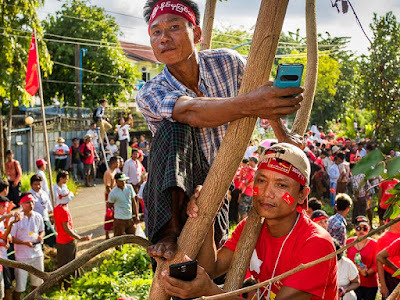 NLD supporters run through the streets of Thuwunna, the suburban Yangon township that hosted the NLD rally, after the rally ended. 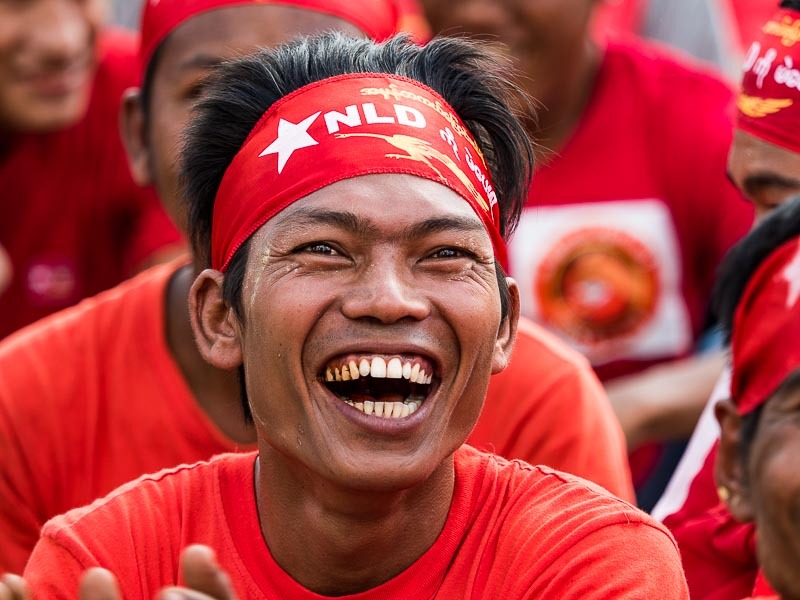 There are more photos of the NLD rally in my archive or available from ZUMA Press.